Teenagers don’t have to have a mouth full of metal to get straighter teeth. The aligners provided by Invisalign Teen treatment are nearly invisible, so friends (and perhaps a crush!) won’t even be able to tell they’re wearing them! With regular braces, comes a long list of foods to avoid for the duration of the treatment. This is not so with Invisalign Teen! Teens can continue to eat all of their favorite foods. The trays are removed when eating and drinking, so both can be continued as usual. Teenagers love that they don’t have to opt out of a bucket of popcorn at the movies, or slathering maple syrup onto their waffles. Because Invisalign Teen functions as a series of progressive trays, teens will spend less time visiting the dentist for check ups and adjustments. 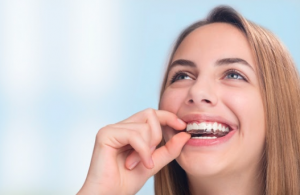 The trays don’t need to be adjusted as traditional braces do, so teens will just visit their dentist when they are ready for the next set of trays. With Invisalign Teen, the trays are removed so that the patient can brush and floss his or her teeth as they normally would. Teens don’t have to use special tools to clean in between the brackets and wires of their braces, and they don’t have to worry about plaque and bacteria buildup in the spots they can’t clean while wearing braces. Contact Your Great Neck, NY Dentist Today! With all of these benefits, it’s easy to see why teens love Invisalign! They can get a straight, beautiful smile through a discreet process, all while continuing to live their busy lives. At Passes Dental Care, we specialize in providing Invisalign treatment to teens and adults. If you have any questions or concerns related to Invisalign or any other dental service, we would love to discuss them with you! Request an appointment, or give us a call today. We look forward to seeing you soon!